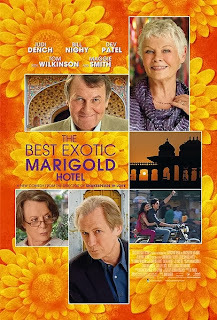 Seven British seniors because of various factors from loss of income, medical procedures, failed investments, death, and looking for new starts all come across brochures for The Best Exotic Marigold Hotel for the Elderly and Beautiful in India. This movie shows what happens when they are dropped from one set of circumstances to another. The hotel is owned and run by Sonny (Dev Patal from Slumdog Millionaire) He believes since people always get old outsourcing their retirement to India will mean while he starts with the British he can get elderly citizens from the rest of the world. He loves the hotel as it was his father's business but its clear he is not the favorite child and the less successful. He has an insanely cheery disposition the entire film. The seven seniors meet each other when their connection to Jaipur is cancelled and they all need to get to the same location. Evelyn (Dame Judi Dench) is a recently widowed housewife who leaves she is broke. She narrates the film as she is chronicling her adventures on her new blog. Since she's broke she gets a job in India. Jean (Penelope Wilton looking younger than she does in Downton Abbey) and Douglas (Bill Nighy) are a married retired couple who invested their life savings into their daughter's internet startup which has only lost money. Douglas is enthralled with India while Penelope refuses to leave the hotel, complains about everything and can't wait to leave. Muriel (Maggie Smith) is a rude crude racist who needs a hip replacement. She goes because instead of a 6 month waiting period she can get it done faster and cheaper. She was a housekeeper before her family replaced her and being retired has made her a sad hardened woman. Graham (Tom Wilkinson) is a judge who finally decides to retire and return the India where he lived for the beginning of his life until he left for university. He has an ulterior motive for returning to his childhood home. Norman (Ronald Pickup) and Madge (Celia Imrie) are both singles on the prowl Norman wants a younger woman and Madge wants another wealthy husband. With the exception of Jean and Muriel all of them try to make the best of this situation and begin to accept and love the place. When Sonny's mother shows up to sell the hotel and tell Sonny to get rid of his girlfriend so he can follow thru with his arranged marriage. The moment when Douglas who clearly has been browbeaten for years finally stands up to Jean the audience clapped. The movie is endearing, you feel contented to the characters, the development of some of them is throughout the movie so you have time to love them and really feel for them. The Best Exotic Marigold Hotel is rated PG-13. It is playing in limited release around the country.